Every 40 seconds, a young person goes missing in the US. In our nation's capital, there are already 501 cases of missing children this year, many of whom are children of color. According to the Department of Justice, when people of color go missing, people are more likely to subconsciously assume that they are runaways rather than victims in need of search and rescue, which further contributes to unsuccessfully finding missing people. Our team wanted to build an application that can find useful information about the circumstances surround a missing person's disappearance. We know that bystanders and people in the background of photos can provide useful information in finding a missing person. LastScene helps people determine the last known location of the missing person they are searching for. A searcher searches for a missing person by inputting a portrait of the missing person, their name, and last known location. LastScene takes this information and returns a list of images from Flickr that fall in that criteria, which are then matched to the missing person's portrait. We then display all of the photos that have the missing person in them. The resulting photos help the searcher put together a mental "scene" for what the situation was like when the person was last seen. 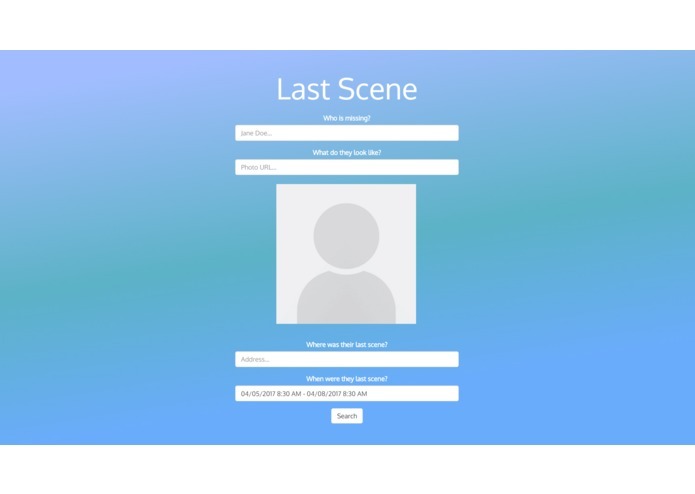 We decided to build LastScene for web because the gravity of the task of finding a missing person is one that we can provide user experience for better on web than on mobile. Our app uses the Express web framework with a Node.js back end. The Google Maps API was incorporated for address autofill and longitude/latitude conversions. The Flickr API was used to extract photos, which were then analyzed using the Microsoft Face API. Understanding the Microsoft Face API was our biggest challenge. 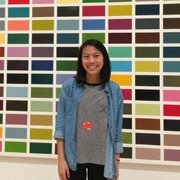 The Face API allows us to search through all of the faces in photos and return the ones that match the portrait of the person the user is searching for. We struggled in learning how to implement the API to train and detect faces as well as weaving it into the fabric of our application for it to seamlessly integrate with the data inputs and following display page. We are proud of coming together as a team to build an application from its initial ideating phase to the final demo. We had the help of many multiple mentors and would not have been able to complete this project without them. APIs can be difficult but if you persevere and ask for mentors, then you can get through it. Flickr is merely one pool of photos that we can pull from. Our search can be much more effective and accurate if we pull from multiple sources. With the hackathon time constraint, we did not implement interactivity with other photo sources, but we would like to in our next steps.